Rain Maintain work with organisations across the UK. 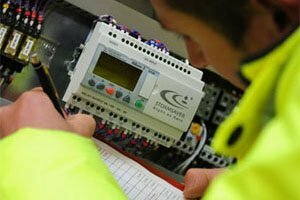 Our team of fully qualified service engineers will ensure your system is properly maintained giving you maximum peace of mind to help you save water, save money and save the environment. A service contract will provide everything you need to keep your rainwater harvesting system running effectively and efficiently. We have several different maintenance contracts available, so we can guarantee there is one that will suit your specific needs! What Type Of System Can We Service? No matter which type of rainwater harvesting system you may have, Rain Maintain can keep the system in optimum condition or bring it back to life. If you want more flexibility this is the option for you. You can book a visit with us when you need it and pay as you go. This is a good option if you are not able to commit to an annual contract, but does mean that you risk letting your maintenance lapse if you do not keep on top of it. Neglecting regular maintenance (every 6 months minimum) could be a costly mistake as equipment may start to fail. Rain Maintain provide annual maintenance contracts and we will visit you twice, at 6 monthly intervals throughout the year to perform a full service on your system. This will ensure that your system maintenance is taken care of over the year, offering you peace of mind and better value for money! Our contracts begin on the date you place your order and visits are carried out at months 6 and 12. If you want an annual contract but cannot wait until month 6 for your first visit, you need a PLUS option. This includes for an initial visit at the beginning or your contract period, at a discounted rate. If your system is working and you want a contract but need an immediate visit because you havent carried out maintenance for a while, then this is the option for you. You will get 3 visits with this contract, at month 1, month 6 and month 12 and our engineers will perform a full service on your system on each occasion. This will ensure that your system maintenance is taken care of over the year, offering you peace of mind and better value for money! Our contracts begin on the date you place your order and visits are carried out at months1, 6 and 12. If you are a maintenance contractor you may have responsibility for multiple sites with rainwater harvesting systems, or if you are a multi site business you may have a number of buildings with rainwater harvesting systems. We can offer attractive discounts for orders for a number of sites. Multiple order discounts are subject to multiple system orders being received at the same time, and subsequent visits combined to reduce travel costs. This is very useful for those with large property portfolios across the UK. This offer covers all rainwater harvesting systems regardless of manufacturer.